Here's a VHS sleeve from the middle entry in the first SPIDER-MAN "movie trilogy". Released in 1979, SPIDER-MAN STRIKES BACK had originally aired stateside the previous year as the two-part TV adventure The Deadly Dust. 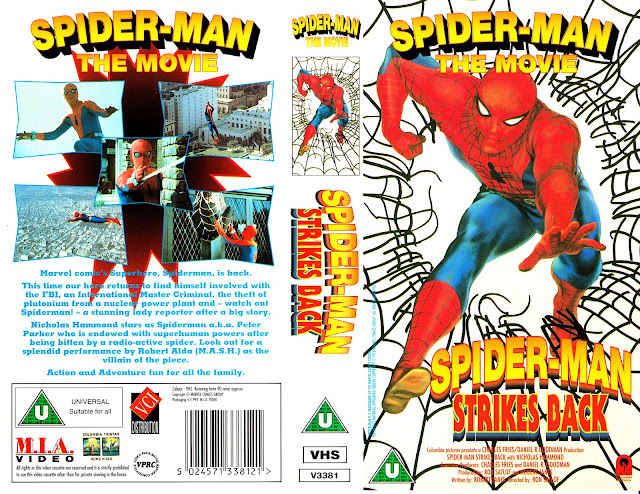 The three movies were staples of the VHS era (this particular release was probably intended to trick unsuspecting punters into thinking they were buying the first of the new films, hence the 'Spider-man the movie' logo) but neither they nor the series that spawned them have been released on DVD although bootlegs are widely available.